"A global odyssey that seeks to discover why geniuses gather in certain places during certain eras and why these hot spots burn out, often after a half-century of grand achievements. Weiner is a superb travel guide: funny, knowledgeable, self-deprecating and always up for sharing a bottle of wine." 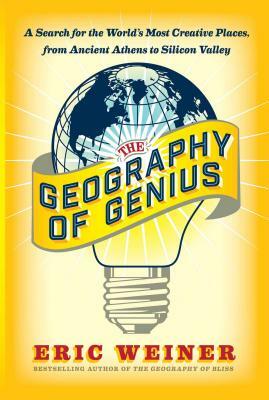 "The Geography of Genius is witty, informative, and compulsively readable. Whether you’re getting genius tips from Freud in Vienna or hearing the secrets of high-tech powerhouses in Silicon Valley, you’ll emerge smarter after reading this delightful travelogue of ingenuity." "It’s rare to read a book that makes you laugh and learn, but Eric Weiner has done it again. This witty, wise explorer offers fascinating insights on how culture has inspired creativity across the ages—ripe for chats at water coolers and cocktail parties—and offers a practical map for how we can all become a bit more inventive." "Eric Weiner has single-handedly invented a new nonfiction genre in which a brilliant and hilarious writer leaves his home and family to circle the globe in search of the answer to a timeless question. The Geography of Genius is an intellectual odyssey, a traveler’s diary, and a comic novel all rolled into one. Smart, original, and utterly delightful, this is Weiner’s best book yet." "Why do certain places produce a spontaneous eruption of creativity? What made Athens and Florence and Silicon Valley? This witty and fun book has an insight in every paragraph. It’s a charming mix of history and wisdom cloaked as a rollicking travelogue filled with colorful characters." "Weiner is an affable tour guide and a lively, witty writer in the style of Bill Bryson; the connections he makes between places of genius are sharp and sometime unexpected." "Weiner illustrates the power that culture and location can lend to creative efforts. Using a series of well-crafted travel essays the author propels readers across the globe… A welcome read for lovers of geography, history of geography, historical travel, travelogues, and the history of science." "In the genial style of Bill Bryson, Weiner scouts the world looking for places that have spawned geniuses."